Before the final assault on the Cairngorms back to some simple thoughts on a beer, eh ? I was meant to be driving down/getting the ferry to the German border for a little beer hunt today but that got cancelled so I went to Getrænkeland instead for a little stock up, nothing special, just some simple standard beers that I like. So, some blogs on them to come sometime. 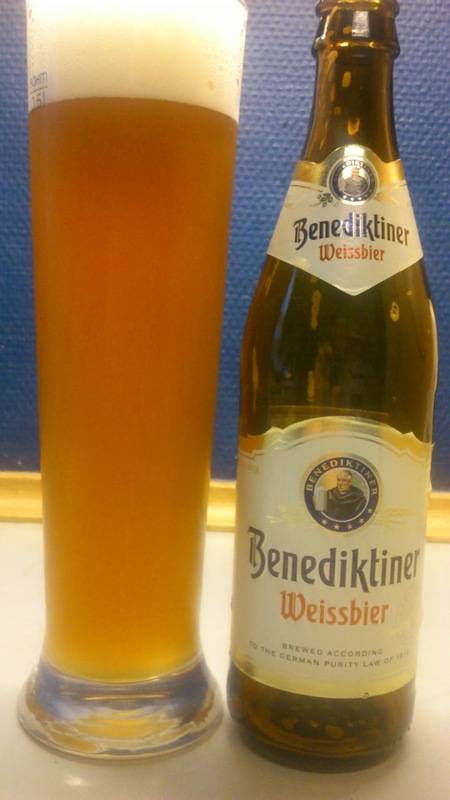 Benedikter pours a dark orange gold with a big dense off-white head. Aroma of banana and cloves when uncapping. Flavours of wheat, yeast, sweet malt and banana on the intake while cloves linger in the slightly sourish finish and in the aftertaste. Decent enough hefeweizen and very good value for money considering a standard erdinger or paulaner is nearly double the price in Danish supermarkets. My only little gripe would be it's a touch watery. This scored 6/10 on my 'he ain't hefe, he's my brother' beerometer. Where to buy DK : Netto, Føtex & Bilka.